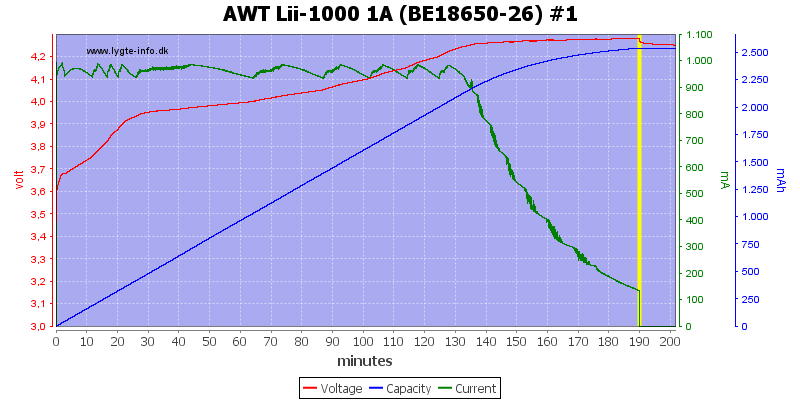 AWT (Aweite Battery Technology) is mostly selling batteries and chargers. This charger they have branded with their own name. The charger is a analyzing charger, it can measure battery resistance and measure battery capacity for one or two LiIon batteries at a time. It comes in a cardboard box, the box lists the functions and specifications of the charger. The box contains the charger, a universal voltage (100-240V 50/60Hz) mains power supply, a car power adapter, a warranty card and a instruction sheet. 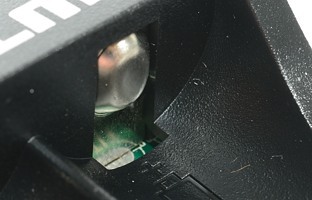 There is a DC power connection on the side of the charger, the supplied power supply or car adapter is connected here. The user interface is a display and two buttons, one for each channel. 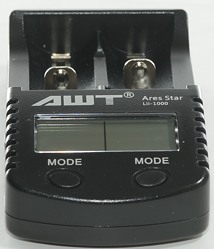 When putting the battery in the charger the mode button is used to select between 0.5A and 1A charge current and to select the Discharge function with a long press. During charge the button is used to change between time, battery resistance and capacity charged/discharged. Holding the button down during charger will reinit that channel, i.e. it is possible to select charge current again. The display shows voltage with one digit and charge data. The battery cradle is made the usual way with a slider, but on my copy of the charger there is a problem with some tolerances. One of the sliders does not move freely, but need a small push to move fully forward. 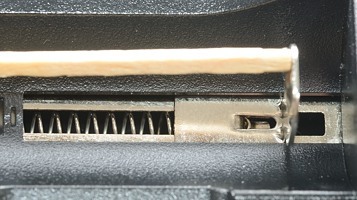 The slots can work from 29 mm to 68mm. This means that not all protected 18650 batteries will fit in the slots. The charger can handle 68 mm long batteries including flat top cells. When not connected to power it will drain about 0.6mA from a the battery. Below 2 volt the charger will charge with 0.7mA. The charger registers a battery at 2 volt or above and applies regular charge current. When charging is finished the charger will apply 0.15mA charge current. Maximum voltage readout is 4.3 volt or higher. Charger will not restart due to voltage drops. Charger always starts with 0.5A charge current. 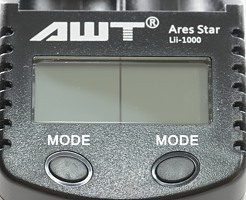 Voltmeter shows within 0.1 volt. Charge will restart charging after power loss, or battery insertion. The background light turns on when a battery is put into the charger or the switch is pressed and turns off again after 10 seconds. The charger uses a CC/CV charging, but the voltage is to high, i.e. outside the LiIon specifications (Maximum allowed voltage is 4.25 volt). The other channel is the same. 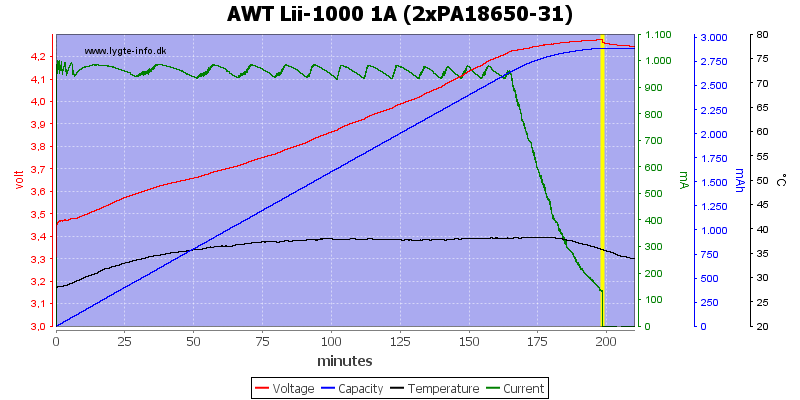 The two other cells is handled fine, except for the high voltage. Reducing the current to 0.5A does not change the termination current. Oops, the overvoltage protection was activated on this battery. Again a CC/CV curve, with to high voltage. My old cell is charged fine with either 0.5A or 1A. No problem with two cells at 1A. 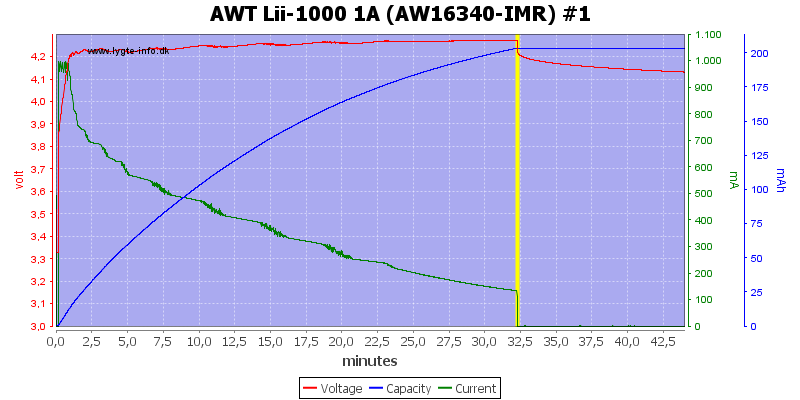 The charger needs about 1A from the power supply to charge two cells at 1A. 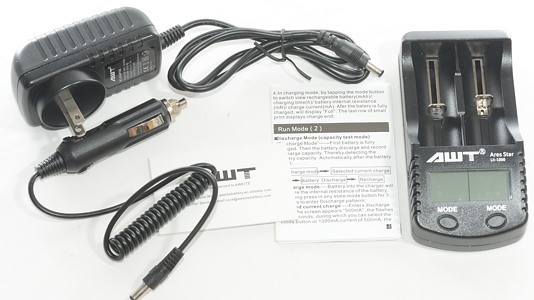 The AWT logo is not cooler than the surrounding parts of the charger, but due to the metallic color it is not radiating heat. No pulsing or anything here. I have placed the power on chart in the "Resistance measuring" section. The discharging is a charge-discharge-charge cycle, i.e. 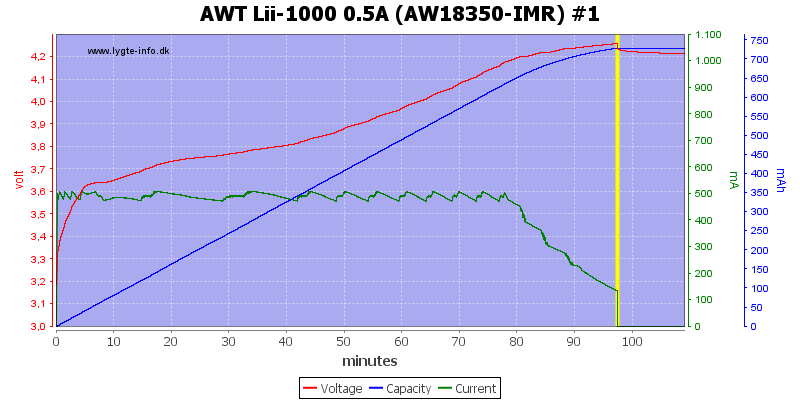 a capacity measurement, not really a discharge. The time and capacity shows is only for the discharge, not for the full cycle. 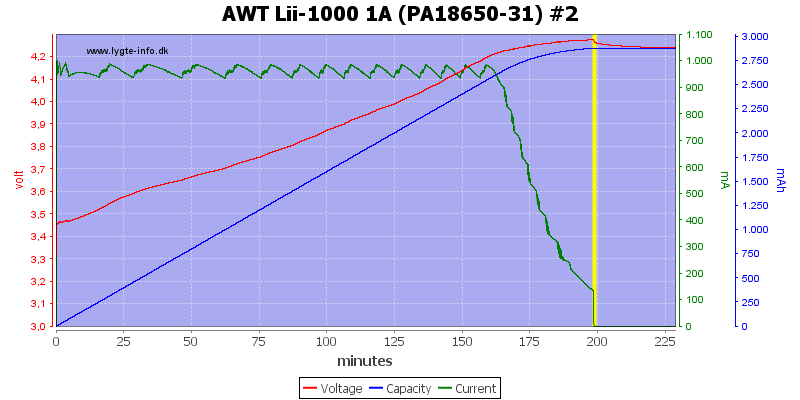 The charger discharged to somewhere between 2.8 and 2.9 volt. 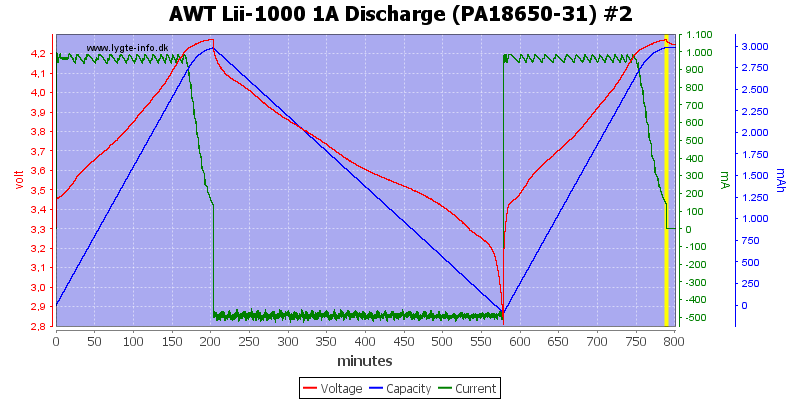 Selecting 1A does not change the discharge current, only the charge current. The second channel looks similar. Discharging two batteries will generate some heat, especially because the charger is without any fan. Discharge is without any pulsing. 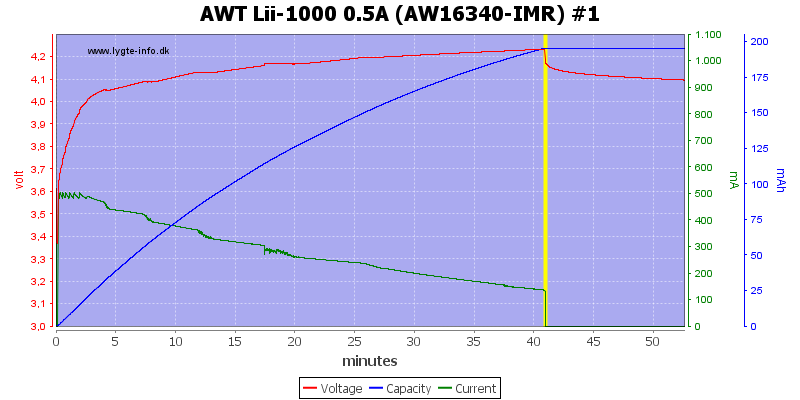 The resistance measurements are fairly consistent, but does not show ohms. 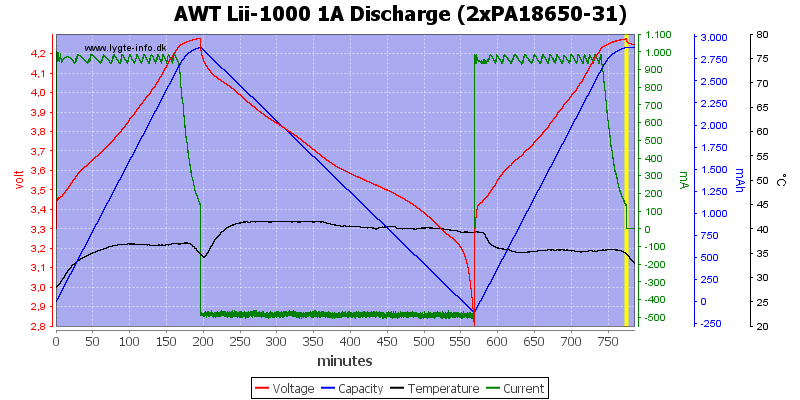 The value can still be used to evaluate batteries. 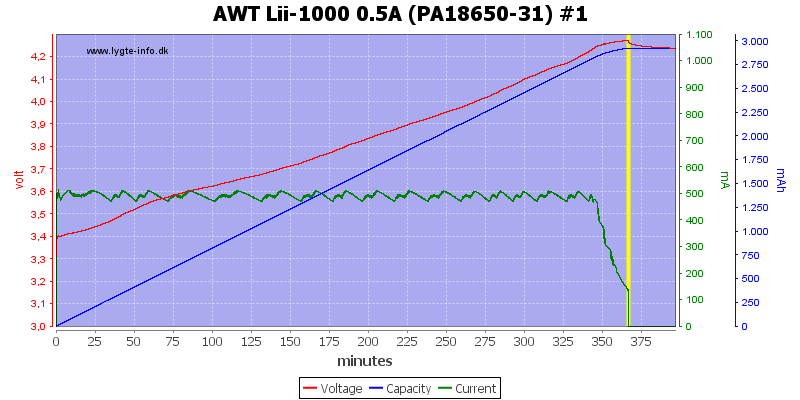 During start of a charge will there be a pulse to measure the internal resistance of the battery. 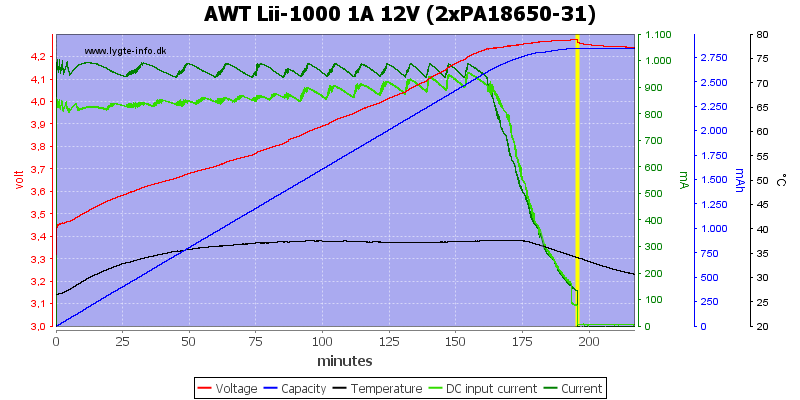 Testing with 2500 volt and 5000 volt between mains and low volt side on power supply, did not show any safety problems. The charger works like somebody has tried designing the simplest charger to maintain LiIon batteries. I.e. provide exactly what is needed with a simple user interface and nothing more. 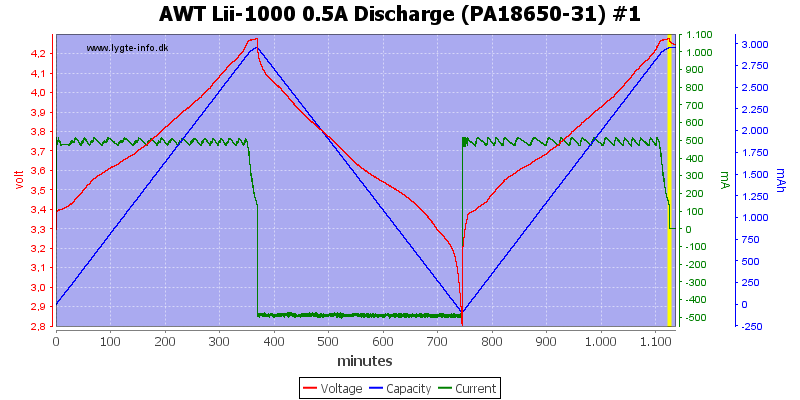 I believe the charger succeeds as a basic analyzing charger (But the values are a bit high), I also like it uses constant current charge and discharge. 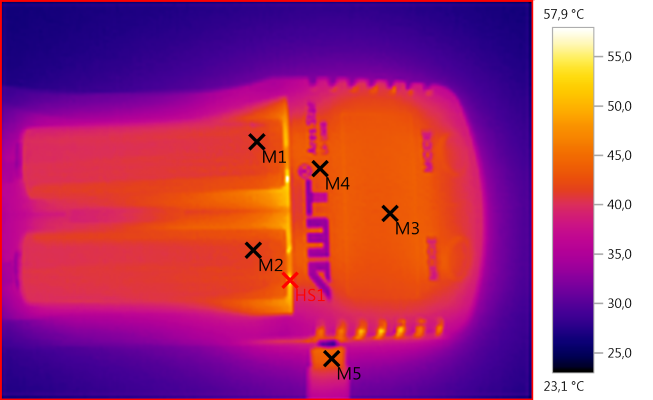 The wrong ohm values is not really a big issue, the trick is to find out at what value the batteries does not really work in a specific light or other equipment. It can also be used to sort batteries into good (Lowest mR value), average, old (Highest mR value). 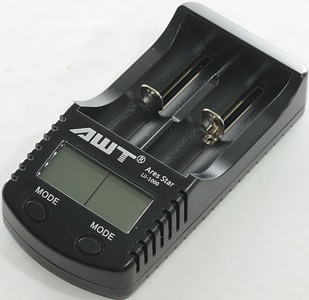 If the high charge voltage is fixed then this is a good charger for people that want a way to check their batteries, without lot of buttons and modes, it is also a good charger just for charging and with two currents it covers many battery sizes. 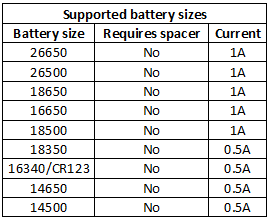 In addition to the high charge voltage it has one caveat, the limit on battery length, this makes it most useful for people that uses unprotected batteries! 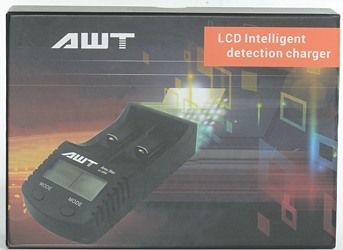 The charger was supplied by AWT for a review.